Photovoltaics (PV) is the way in which sunlight is turned into electricity. 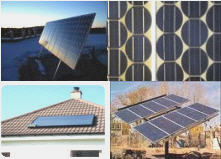 There are a number of technologies that provide PV energy. The field of PV is rapidly expanding due to energy and environmental concerns. These systems provide electricity where utility services are not available. Stand alone PV systems are typically used for remote home sites or places where the cost for utility service may be prohibitive. These systems interface with the conventional utility system. Grid-tied PV systems are used to augment or offset a home or business electric demand. With loss of utility power the PV system shuts down. These systems are the same as grid tied PV systems but are designed to provide power in the event of a utility outage. Typically, when there is cloudy weather it is often windy and vice versa. In the winter months more energy is produced by the wind resource with supplemental energy coming from the solar resource. In the summer months the long hours of sunshine produce the majority of the energy, with the wind acting as the supplemental power source. In the fall and spring both the wind and solar resources contribute more equally to the electricity production. The current movement in the PV industry is toward the use of this type of system. It is the lowest cost and most easily managed of all the PV systems. World wide grid tied PV system installations have exceeded forecasted growth. Why? PV makes sense from both an economic and environmental position. Grid Tied PV systems can be installed wherever the sun is shining and utility service is available. The concept is simple, when sunlight hits the PV panel electrical energy is produced. The energy is then routed through electrical devices to your breaker box. If more energy is being put into the breaker than is being used the solar power runs back to the utility and your electric meter runs in reverse. Proper design and installation of these systems is crucial in order to get the best possible performance for your system. Utility rate structure, site and electrical demand will determine the system components and design best suited for your needs.